On Saturday evening in Atlanta at the United States Aquatic Sports Convention, Katie Ledecky was named the USA Swimming Athlete of the Year for a record-breaking 4th time. Ledecky became just the second woman in history to win the 200, 400, and 800 freestyles at the same Olympic Games in Rio, and added a relay gold in the 800 free relay and silver in the 400 free relay. 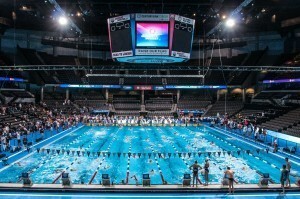 The haul included World Records in the 400 free (3:56.46) and in the 800 free (8:04.79), both by astounding margins. The latter of those swims earned the Performance of the Year honor as well. I agree with you on her 400 free being more impressive, but not on her declining at Stanford. She’s trained with Meehan before, through national teams etc. and Gemmell has been there with Meehan telling him the ins and outs of training Ledecky. Meehan has also said in the past that if he ever encounters any problems or has any questions while training Ledecky he will not hesitate to ask Gemmell. They know Ledecky is a once in a lifetime athlete and they know they must do their best to preserve her talent. I trust Meehan, he’s shown in the past he’s a very very good coach, with Eastin, Manuel, Neal and Dirado. Ledecky is in good hands. And start in 2021 she will start decline, but unless there are phenom in 400 and 800 she will still dominate until 2024. Bobo I disagree. 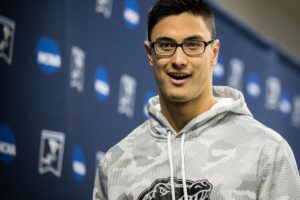 WR in 200 free should be 2017-18 goal. That will motivate her more. To some extent I agree. There will come a point where her body won’t let her break world records ever time she swims. She will eventually have to wait until she tapers. I’m not sure she has reached that point yet. (well, maybe she has for the 400). I think she has more than a couple WR swims left. Not sure why anyone would write her off yet. Agreed. Based on her 800 time, I think she can take another hatchet to the mile record. Will her body allow her to train at peak world class levels for another four years without a break? This is one of the reasons Ledecky’s decision to attend college instead of go pro is a calculated risk. By going to Stanford she loses control over her training for the next four years. If she stayed with Gemmel she could have taken a year off. Frankly had I been her coach I would have suggested no training at all until next year. But the coaches at Stanford will make no such allowance nor should they. Meehan has done very well with Simone and Maya. It shows he can coach a variety of swimmers (not just one swimmer). Has there been any evidence of her slowing down? No evidence at all. But there is a limit to any elite athlete’s ability to maintain world class conditioning and peak training. Ryan Lochte went at least ten years without a break before he began to slow down a few years ago. Missy Franklin didn’t last five years before she began to experience what looks to me like the results of long term overtraining. And Katy Ledecky has limits too though we have yet to see them. I just hope that she isn’t overtrained by another four years of competitive swimming. Katie does it the second time. It is not often when personal trainer receives such recognition.